The Isokern B-Vent (IBV) is the only field assembled, modular refractory, gas only, top-vented appliance in the market today. 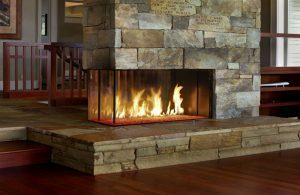 This fireplace can be installed directly on a combustible floor system while still meeting ANSI Z21.50 guidelines. The IBV is a complete fireplace system including the required safety components, gas log burner and the Stadium Burner gas log set.